Poppin in this Tuesday to share a little project I got to yesterday. This is a perfect little gift for someone this Fall or use yourself to cheer up a little cubby somewhere in the home this season. 15th and a new challenge over at the RRR blog. This time it is a sports challenge with ribbon. Now I looked and I looked through my piles of papers etc and just could NOT find anything sports related. I also do NOT live in an easy area to get a hold of something like that...yes I live in the boondocks. So this image from Riddersholm Designs caught my eye.....dog shows. The dogs certainly are athletes at a Dog show...right? I thought it worked anyways! I used both black denim ribbons and a bit of black seam binding to really make my bow full. Love the loopiness of it. 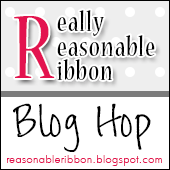 The 12th is my day over at the RRR blog! More Halloween goodness to share....sorry! A sweet little double stacked vintage spool goodie! Using orange and black seam binding and May arts burlap string in black. I used wood vintage spools and added JB chipboard buttons to each top...stuck a lollipop stick in the middle and added my star top along with a vintage image covered in a glass cabochon. I added a few other little trinkets and done! Ya'll ever heard of the black cat society??? NO? Me either....I made it up! Sounded cute anyways! Hopefully it grabbed your attention...if not these adorable images should have. I love me some black kitty cats.....so cute. 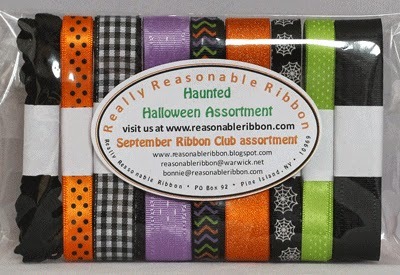 I had fun creating today using the new Haunted ribbon collection from RRR. It is the September club ribbons and they are so cute! I also used May Arts denim black and orange seam binding. The base to my one project is actually a vintage black spool of crochet yarn. I also used a vintage orange sewing tape and a cute vintage orange and black dairy cap. Kitchsy and unique. Enjoy and happy Friday!